In this paper it is presented a markerless multi-view vision-based system to create a spatial representation of an indoor environment. 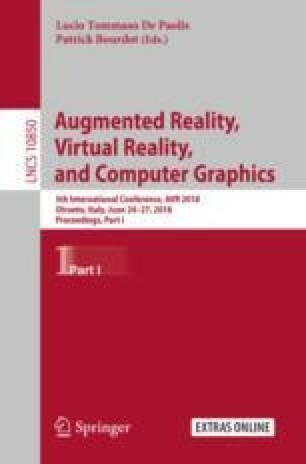 Mixed reality integrates real-world elements into a virtual world. The modeling of such elements should be accurate to avoid interaction inconsistencies. The goal of this work is to achieve the virtualization of a room and its elements, providing seamless user navigation and interaction. This spatial representation based on grid maps provides a clear distinction between occupied and free cells. Scene objects are segmented using clustering techniques. The proposed approach has several potential applications, such as interactive virtual visits to heritage museums, real estate, and training scenarios. Preliminary qualitative results evidence a visually accurate modeling of the considered scenes, identifying elements and free space, encouraging future work towards the identification and tracking of static and dynamic elements on the scene. This work was supported by the project POCI-01-0247-FEDER-017644 HTPDIR - “Human Tracking and Perception in Dynamic Immersive Rooms” financed by the Portugal2020 program and European Union’s structural funds.